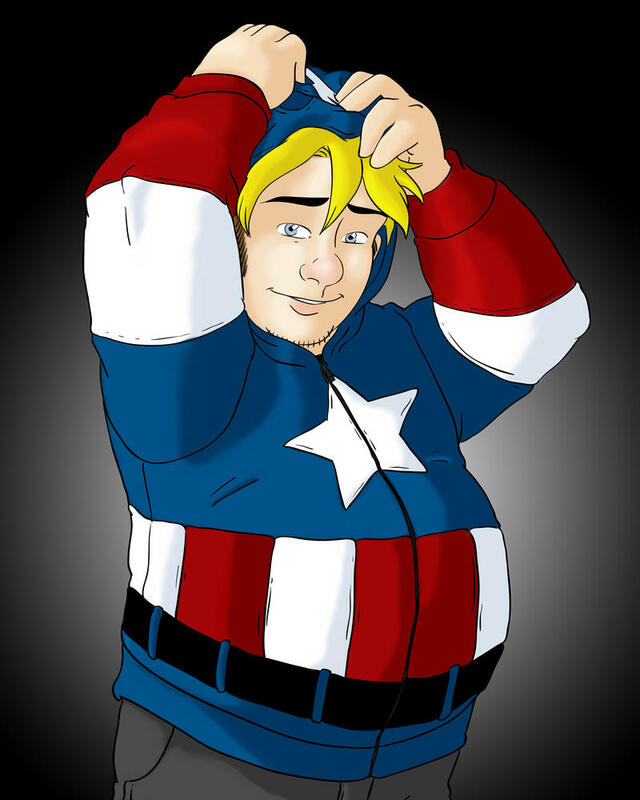 I know some of you guys are missing Jeremy... so here's a picture of him wearing a Captain America hoodie. :) I totally want one. I used some different coloring techniques, what do you think? New update should be up on Wednesday, thanks so much for being fans. First I sketched the drawing on paper with a pencil (I had to use a picture of myself for reference on the pose, haha). Scanned it and redrew the black line art in Illustrator. The colors I did in Photoshop. I used the lasso tool to select areas of color (Like Jer's face). I filled it with a flat darker color, then used a soft brush with the lighter color set on screen mode and 50% opacity. I learned at a coloring workshop last weekend that when you use screen mode for the brush, every time you put a new stroke on top of the previous stroke, the color becomes lighter. I found that it blends best if you make your brush size really large too. and I think it helped make everything more blended. I dropped the opacity down to 40%, used a combination of normal and screen mode and made some of the highlights smaller and more subtle. By the way, I commend you on taking the non-traditional approach to the romance. ;-) Usually a romance story will drag on forever with terribly agonizing relational and physical tension. But you got that out of the way and are moving into the much deeper stuff. Well done!